Clickertown recently produced its first official limited runs of apparel with our orginal designs, which are currently being sold exclusively at Cottleville Crafts, Etc. in Cottleville, MO (St. Charles County). In line with our mission of providing the citizens of Clickertown value through quality original designs on quality products, our designs are on the high quality Bella brand line, including Bella Baby. Bella states, "We have over 10 years of experience manufacturing women's clothing for the leading retailers in the world and this expertise has been the platform for the Bella line. In producing for these top retailers we had to meet the highest and most stringent of quality standards. In creating Bella, we applied these strict guidelines to our product line. We wanted only the softest yarns, the highest standards of sewing construction, the longest wearability and most importantly, the best fit. This dedication to quality, consistency and striving to be best has led us to become the #1 supplier of ladies clothing in our industry." To find out more about Bella, please click the following: Why Bella. Also, please click the white links below for specific Bella item details. 1.) 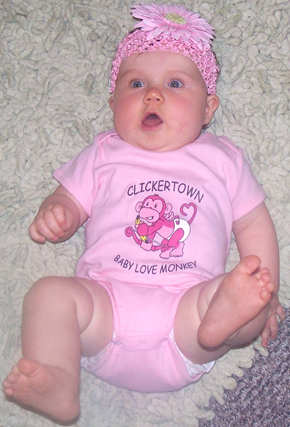 Bella Baby short sleeve Pink and Blue creepers with the Clickertown Baby Love Monkey design. These high quality five color design creepers are available in (sizes: 3-6 months, 6-12 months, 12-18 months, and 18-24 months) for $19.99. 2.) Bella Baby rib/infant creepers with contrast color binding (Baby Blue/Navy, White/Baby Blue, and White/Pink) in the same sizes and with the Clickertown Baby Love Monkey design for $19.99. 3.) Bella Short Sleeve V-Neck T-Shirts in Pink and Ocean Blue with the Clickertown Peek-A-Boo designs. These high quality four color design V-Necks are available in sizes S, M. L, XL for $19.99. 4.) Bella Crew-Neck T-Shirts (Ocean Blue, Berry, and Pink) in the same sizes and with the Peek-A-Boo designs for $17.99. Please click on either picture below to see all pictures related to above apparel, which includes additional information..